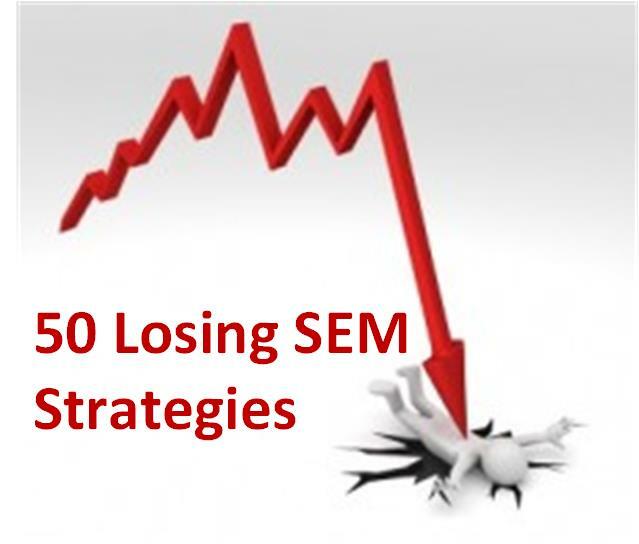 In our practice, we encounter a lot of confusion and misguided understandings concerning what Strategic Enrollment Management (SEM) and especially, what planning Academic SEM is about (see 50 Losing SEM Strategies). The laments around planning are numerous, “too complex, too big, too long term, make it simple, I need a quick fix…” blah, blah, blah. The cold hard truth is that Academic SEM is not simple and it is a primary reason why it is such an important emerging profession. Don’t take this the wrong way. There are plenty of ways to achieve short term bumps (see the Art and Science of the Bump) and bring in pockets of enrollments to backfill budgets. We all know those are an integral part of our tool box. Just focusing upon them, however, out of context of the holistic spectrum of Academic SEM, is always a losing proposition. This post is a simple articulation of the scope of Academic SEM planning. Academic Strategic Enrollment Planning and Management is an institution wide function involving virtually all divisions, units, colleges and key decision makers. This means a multiplicity of systems, functions and perspectives must align and work together in order to achieve optimum enrollment performance. The various elements including systems, functions and perspectives must work together synergistically, to achieve optimum performance. We array sixteen discrete elements in four layers, consisting of four elements each. Guidance and direction is provided within the Strategy Layer, the capacity to perform is detailed in the Capacity Layer, functions are defined and aligned in the Operations Layer, and the Systems Layer provides rules, content, metrics, automation, data management, etc. to make it all work. 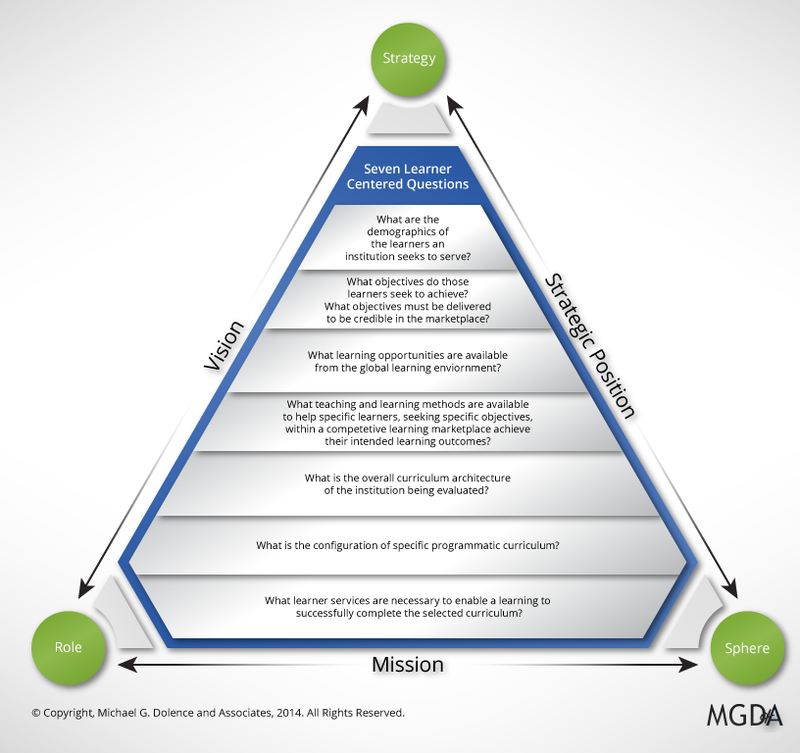 The strategy layer drives virtually all functions within an Academic SEM enterprise. The layer consists of at least four symbiotic integrated planning foci. The Institutional Strategic Plan articulates the mission, vision, and major goals that define the future direction of the institution and establishes basic operational commitments. The Academic Master Plan translates those commitments into a discrete academic portfolio and program functions. The (Strategic Enrollment Management) SEM Plan seeks to align the Academic Master Plan through enrollment management efforts and initiatives with the dynamics of the global enrollment environment. The SEM Plan must inform both the Institutional Strategic Plan and the Academic Master Plan in iterative cycles in order to achieve alignment. Together, the Strategic, Academic and SEM plans function to develop a Strategic Position among peer institutions and competitors for resources, students, faculty and staff. Strategic Position is the result of academic strategy, marketing, and the net effect of multiple subsystems all coming together to create a sustainable competitive capability. The Capacity Layer involves at least four interrelated conditions that must work together to get any meaningful academic SEM initiative to work. The organization’s Human Capacity must possess the requisite knowledge and skills across critical functions in order to succeed. The work must be achievable in the work plans of the organizational entities and key individuals across the institution. An institution must have the Organizational Capacity including the systems, methods, tools, processes, as-well-as, the planning and management acumen to undertake and successfully complete complex, integrated, tasks that build to long term success. The Physical Capacity to manage enrollment loads, residency functions, and specific academic pedagogy requirements must be present. The institution must develop and sustain the Fiscal Capacity to develop the resources to support the enterprise. Academic Strategic Enrollment Management is a comprehensive process designed to achieve and maintain the optimum recruitment, retention, and attainment of students where “optimum” is defined within the academic context and results in the strategic position of the institution in the learning marketplace. Operational Acade mic SEM involves four primary lenses: Recruitment, Retention, Operations (back office, front facing, calendaring, scheduling etc.) and the Academic Portfolio. Recruitment is defined as an active process an institution undertakes to influence a learner’s decision to attend. Retention is defined as the maintenance of a learner’s satisfactory academic progress toward her or his pedagogical objective until it is attained. SEM Operations involves a number of cycles and their component processes. Cycles involve Curriculum Development and Revitalization, Recruitment Campaign Design and Development, Campaign Implementation, Yield Monitoring and Optimization, and Retention Management to name a few. Each cycle contains preconditions, policies, processes and procedures. They involve individuals from across academic and administrative units and result in predicted outputs all arranged in a time series workflow that is calendared and resourced. All curricula reside within an institutional or organizational context. The context is defined by the mission of the organization in which it resides, the stakeholders who shape that mission, and their vision of where the institution is going and how it is to evolve. All curricula result in outcomes, in other words, they have a tangible and often intangible impact upon those that engage it. The outcomes may be expected or unexpected. They may be intended or unintended. They may be measurable or difficult to ascertain. All curricula have an economic reality that they exist within. It may be stable, adequate, inadequate, growing, shrinking, or in a state of flux. The economic realities shape a great deal of what the curriculum is and how it is delivered. All curricula have an architecture either both well defined and articulated, or defacto, having evolved over time. By architecture we mean that all curricula have a defined structure that fits many parts together. Each identified part is defined and has a defined role to play in the overall function of the system. The sum of these characteristics helps to define a curriculums’ (system) architecture. The curriculum architecture is framed, enabled and dependent upon the institution’s Information Systems; academic and administrative Policies, Processes and Procedures; the organizations Human Capital Development; and are informed and guided by the institution’s Performance Metrics. In Academic SEM Planning, we consider all of these elements and aspects of the academic and enrollment domains in the planning process. It makes Academic SEM Planning seem at first blush very complex. Upon reflection, it should be understood as a mega system of subsystems and key components that must fit and work together. – James Carville (circa 1992 serving as chief campaign strategist) during the first Clinton campaign for President. I often think back to that campaign for the Presidency of the United States and the impact those few words had on the outcome of the election. It brings to mind a nagging malaise among a number of client institutions who wish to energize their recruitment and retention success. I often parrot Carville’s quote, “It’s the curriculum, stupid,” when analyzing enrollment problems. An initial strategic enrollment management engagement often centers around harvesting any number of descriptive observations by client constituents: not enough students, too many students, too many here not enough there, students not the academic quality we want, the list continues with various emphasis and causal inference. Inevitably someone blames the economy, the web site, the enrollment management system, or admissions, or the president, or marketing. While any and all of these may be contributing to a problem the real heart of any educational, organizational success is the curriculum. This is not to blame faculty or anyone for that matter. It is about recognizing how to shape and promote curriculum for a competitive market. Crisis has a way of blinding folks to clear thinking, realistic strategy development, focused tactics, and forced implementation on yield. One of the tactics that are very effective in the short term is what we call the ‘Bump Strategy.’ A bump is a short term windfall in enrollment that is based upon specific institutional characteristics. The Bump Strategy goes like this. An opportunity is discovered and developed to achieve a one time elevation in enrollment. These can be pockets of 40, 60, 100, even as high as 250 enrollments that can usually be achieved over three years or less. Looking at a longitudinal analysis they appear as a bump in enrollments if more serious long term strategies are not developed in parallel. We often deploy a bump strategy when dealing with an enrollment crisis. When engineering a bump we look for under recognized opportunity, incomplete or incomprehensible academic narrative, underestimated market/program of study value, or precious pockets of unrecognized market opportunity. Bump strategies are a two edged sword. They do yield a temporary bump in enrollment. Because they are pocket opportunities, they cannot sustain a growth trajectory although they often can sustain a higher enrollment plateau. They have one lethal unintended outcome. They take the pressure off and derail investment in new long range strategy and allow reversion to the ‘old ways.’ If the money from the bump is wasted then meaningful growth falters. No institution has an unlimited number of bump opportunities and once they are used they are gone (they do not yield forever). Each bump is unique to the institution and is dependent upon finding the right enrollment alchemy using indigenous curricular elements to exploit known enrollment dynamics. The best time to tune your Academic Strategic Enrollment Management strategies is when you are not in crisis. That is when a focus on your Strategic Position in the Global Learning Marketplace can yield the best outcome. When not in crisis is the time to carefully construct a long term academic enrollment management program designed to build forward momentum over multiple future cycles to achieve a sustainable enrollment profile. Our projects are as varied as the extensive client base we serve. They include initiatives to significantly increase perceived value of General Education, the redesign of the first year experience, the reconceptualization of the general education model around engagement, integrating partner marketing into program design, exploiting pocket markets, aligning curricular narrative with market dynamics, differentiating curriculum among crowded competitive environments, curriculum narrative to entice early decision, and the list goes on. To explore opportunities to collaborate use our Academic/Enrollment Strategy Clinic Offer. The roots of failing enrollment management strategies can often be detected in the things people say when asked about enrollment. The following are paraphrases (to protect the innocent) of quotes we have collected over the past few years that reflect losing Strategic Enrollment Management strategies. All of these paraphrased quotes come from institutions with declining enrollment scenarios resulting in budgetary reduction ramifications. They were collected from our notes between 2013 and yesterday. They are in no particular order. They are numbered for reference in comments should you decide to. If you have quotes you would like to add, send them along or for the brave – post them in a comment. “I really don’t want to hear about long term anything. It is June 1 and we have a serious budget hole I need fixed by September. Seriously, you should have gotten the message when I rejected your five year enrollment plan because it did not fix our short term revenue needs.” – President to VP for Enrollment Management June 1st. HELP! Here are a ideas to help differentiate by using Academic SEM Strategies. Understand academic strategic advantages and how to recognize, develop and showcase them. Understand the dynamics of the emerging global digital learning ecosystem and its impact on the future of education. Develop an academic narrative that differentiates. Ensure your plan delivers a balanced short-term (bump), medium-term (program market revitalization), and long-term strategic position approach. Then live the plan. Invest in increasing the value of your student’s educational experience, and that means curriculum. Recognize that the underlying issues that created such tense market dynamics defy quick marketing, branding, slap together program fixes. Doesn’t mean marketing and branding are not important, they are, but it does mean success requires much more than billboards on freeways, placards on buses, going on-line, and hastily copying others curricular portfolio. Recognize it takes an Academic/SEM Team to achieve a competitive strategic position in the dynamic learners market that is today and tomorrow. Recognize the gift of ‘bump’ strategies that provide a short term increase in enrollments and the precious investment dollars they provide to continue meaningful transformation. So, what can be done NOW? Starting with mining the mission, and re-conceptualizing your Strategic Plan as ‘Curriculum-Centered’ and the Curriculum as ‘Learner Centered,’ then focus on strategic position. How? Use the Curriculum-Centered Strategic Planning Model (CCSPM) and the SRS Method as reference. This is not a long drawn out effort, it starts with evaluating the existing strategic plan and assets and creating short-term market wins. In the process identify opportunities for program market revitalization and develop a strategic market narrative. Use Academics, Programs of Study, Curricular Elements, Research, and learner experiences to create a compelling narrative that builds competitive strategic position. Use the emerging principles and practices of Academic SEM to enhance your strategic market position by developing a long term, sustainable strategy. Use bump tactics to gain in selected areas in order to fund broader innovation and revitalization and pave the pathway to a strategic market position. Make everything count toward the future. There are numerous ways and methods to begin an Academic SEM approach to sustainability. The following links provide options, information and opportunities. 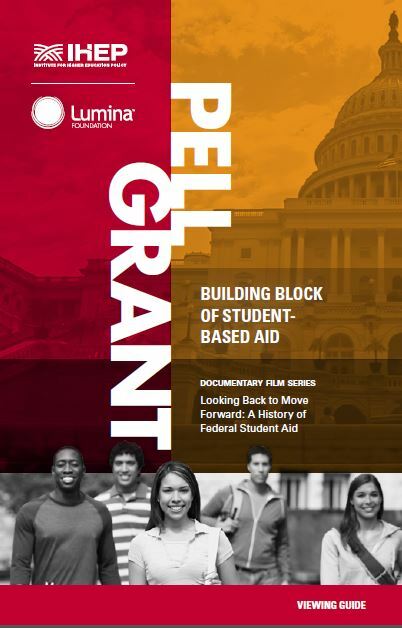 The Lumina Foundation has posted a three part documentary on the policy and the political origins of U.S. federal financial aid programs. These resources are a great background training for student affairs professionals, academic leaders, and enrollment management professionals. A summary of events affecting student financial aid, including key Federal legislation. The U.S. Department of Education’s (ED’s) central database for student aid. NSLDS receives data from schools, guaranty agencies, the Direct Loan program, and other Department of ED programs. A timeline summarizing the history of the Free Application for Federal Student Aid (FAFSA) and need analysis formulas. Download the companion PDF to the series. Finally an office graphic that conveys the complexities of Academic Strategic Enrollment Management. The Poster begins with a carefully detailed Enrollment Funnel (no the funnel is not dead, in fact it is healthy and thriving). It then portrays the five integrated and complex cycles that build curriculum, develop & implement campaigns, monitor retention and attrition and evaluate SEM Performance. Finally it concludes with the SEM Matrix, juxtaposing seven dimensions of SEM with a framework of seven learner centered questions. We offer the poster individually or in packs of five. Clients report using them for training, loaning them for deans and department chair meetings and using them to guide complex conversations with executives and boards of trustees. Order today! 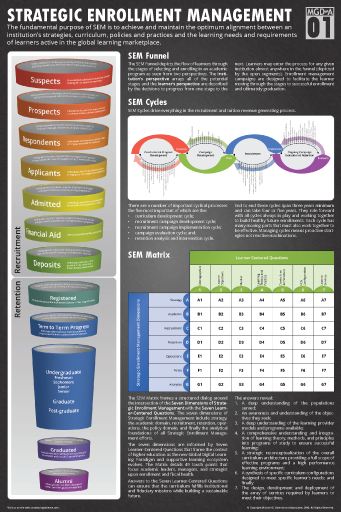 Depicts the intricacies and interrelationships of the five integrated cycles that inform Academic SEM. We offer the poster individually or in packs of five. Clients report using them for training, loaning them for deans and department chair meetings and using them to guide complex conversations with executives and boards of trustees. Order today! I promised a recent class of Education Graduate Students some links to tracking the roller coaster ride of enrollments over the last few years. Below are some useful links tracking trends in enrollment issues. We all know timing is everything. Some of the first strategic elements an enrollment crisis disrupts are the Academic and SEM Cycles & Workflows. In fact, it is one the biggest challenges an institution faces in an enrollment crisis, to stay focused on performing SEM cyclical activities and developing strategies. Suddenly, a shortfall in enrollments and the concomitant shortfall in revenues can cause shock waves of second guessing, demands to alter the course, change tactics, new leadership, new people, etc. The desire to shake things up in order to appear that decisive action is being taken can be overwhelming. But before acting upon any of these impulses, a little reality orientation is in order. Recognize that higher education is in the middle of the most dramatic paradigm shift in its history accommodating the emergence of a global digital learning ecosystem. One result is an explosion of options for learners to acquire sought after learning objectives. Additionally, higher education is experiencing a demographic shift and a demand for greater accountability and higher productivity. Learners are facing economic crises and face significant challenges meeting educational costs as evidenced by the extreme debt burden. At the same time, institutions are facing their own unprecedented economic challenges emanating from the demand for more services, increased regulation, and because of demographics and competition, low growth or declining enrollments. These realities impact virtually every aspect of higher education’s structure and function. In this light, it is advisable to take a systemic view of how enrollments are developed and work within a defined structural framework to develop a closer alignment with learner markets and enhanced educational outcomes. It is a complex task, and for the framework to be affective, it must be inclusive across academic and enrollment management domains. This requires the integration of practices between academic and enrollment management outside the normal culture of most institutions. To borrow Hillary Clinton’s metaphor from her 1996 book, “It takes a village to (raise a child) deliver enrollments.” Specifically, an Academic–Strategic Enrollment Management Village. We focus in this blog post upon understanding the structured cycles and workflows that are behind every enrollment report. Realize that every enrollment report has behind it a three to four year rolling cycle that delivered it. For example, this post is being published in December 2014. As you read this post you should be in the middle of planning the campaign(s) to be launched in the fall of 2015 to deliver enrollments in fall 2016. This means that the curriculum, as it exists in fall 2014, is responsible for delivering the fall 2016 enrollments. If academic innovations or revitalizations are being developed to influence fall 2016 enrollments, they must be very carefully integrated into the campaign plan being developed now. Rarely do academic, and SEM communities engage in such careful dialog, planning, analysis, and integration. To give life to the metaphorical village, MGDA launched the Academic Strategic Enrollment Management Initiative in 2014. The initiative began with the Academic SEM series of posts in the MGDA Higher Education Blog. We then began engaging academic and SEM leaders in the community of practice group in LinkedIn. We then turned our focus upon Sustainability by developing Academic SEM Institute (December 2014 and to be repeated in June 2015). Most recently, we announced our 2015 Transformational Institutes Series to provide deeper support and development to our clients. In order for academic and enrollment management communities to work better together, they must first understand the basic cycles and workflows that culminate in an enrollment report. Such understanding is required at all levels – from the President and Vice Presidents, to the deans, faculty, academic and enrollment staff. So what are the cycles? 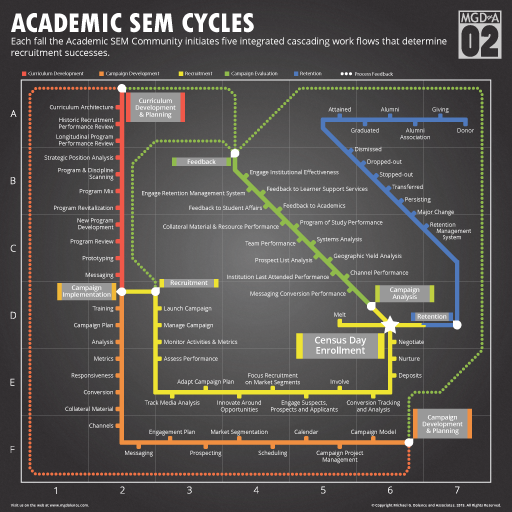 They follow the flow depicted in Figure 1: Academic/SEM Cycles Overview. Five stages in four highly (but not totally) linear arrays of activities. The first stage involves the design, development and implementation of the curriculum. This stage is guided by academic and accreditation policies, processes and procedures. Curriculum cannot be offered for enrollment until the criteria are met, and approvals are granted. It is the curriculum that learners enroll in, and the specifics of the curricular requirements form a contract with the learner. This stage is ongoing throughout the year. The second stage involves developing a campaign to find, attract, and persuade students to enroll in the institution’s curricula. The second stage begins in the fall with a review of the last campaign yield for current fall enrollments. It also utilizes the day to day experience of the current campaign underway (to deliver next fall’s enrollments) as a frame of reference. The primary focus is the development of the campaign to be launched next fall to deliver the following fall’s campaign. In most institutions, these campaigns roll together in a continuum from year to year. We separate them to focus the evaluation, design, development, and implementation on discrete cycles. 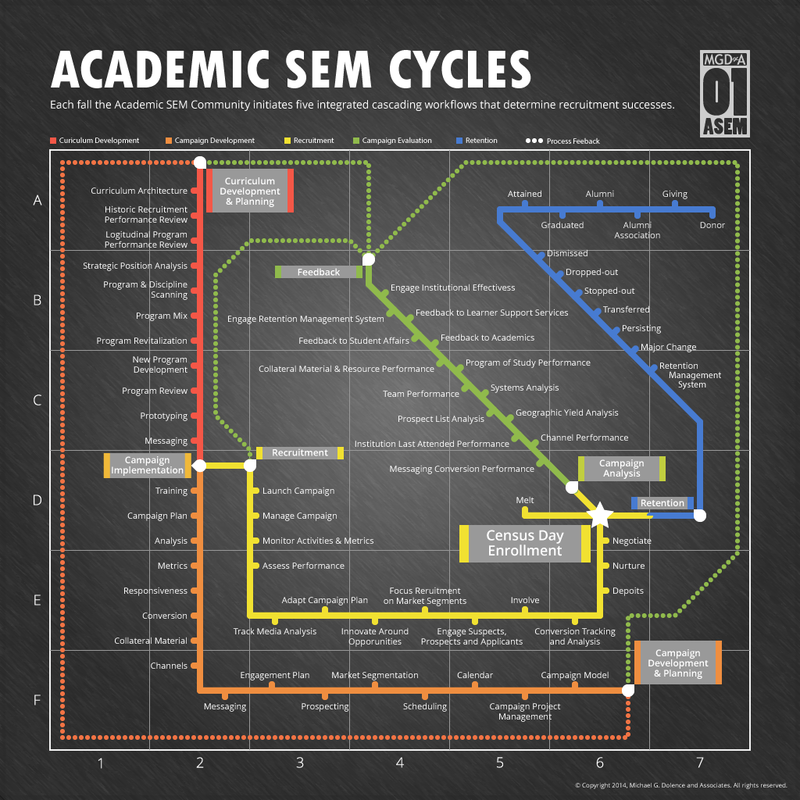 Figure 1: Academic/SEM Cycles Overview. The third stage involves campaign implementation. Its purpose is to deliver the next annual class of freshmen. The function of the campaign is to identify prospects and systematically nurture them through the process of choosing and enrolling in a curriculum. Campaign implementation begins in August/September and ends usually on enrollment census day the following fall. The fourth stage involves two distinct pathways. One follows the students through formal retention monitoring and intervention, the other engages the Academic SEM community in formal comprehensive evaluation. The fourth stage Academic SEM is ongoing and interfaces with Institutional Effectiveness, Research, and Assessment activities. The fourth stage Retention path is ongoing and interfaces with academic and student support services. All of these stages are running simultaneously within annual cycles. The parallel nature of the cycles is the source for significant confusion in understanding why an Academic SEM full sequence of cycles involves three to four years of calendar time. Campus leaders rail against this basic pace and often try to force academic program work in the current fall term and demand it impact the next fall’s enrollment. This naïve understanding of how enrollment building works may lead to weak, impotent curricula, and may distract academic and enrollment staff from building strongly market aligned programs. Hasty and ill focused action can create the illusion that one can just demand a fix, and it happens. Clarification requires a little more detail. Within each cycle there are a number of tasks, processes, and procedures, collectively called workflows. They conspire when aggregated to achieve each cycle’s outcomes and feed the next cycle and other workflows. Figure 2: Academic/SEM Cycles & Workflows, adds, in outline form, the various elements and steps that are included in each of the stages. Note how the workflows attach to the cycles. In reality, the working groups involved in each cycle possess unique organizational cultures driving each cycle and the workflows that comprise them. Let’s examine them one at a time. The bullet list below will permit you to cut and paste should you decide to make a deeper example for your institution of the actual processes utilized. Remember these are not intended as exhaustive lists, each institution has its unique array of processes and lexicon. So, how does this all work together? If your response was, well, it doesn’t, you would be in the majority. We all know the fall work plan is overloaded with getting the new academic year started and a new class settled. The fall starts anew, getting the year’s workload underway, adapting to the fall enrollment numbers and corollary budget that it drives. New gives way to preparing for the fall board of trustee’s meeting and engaging the suite of integrated workflows that deliver enrollments. Time is short, too many meetings, and the holidays come out of nowhere and the term ends. Suddenly we realize that it is mid-January, and it is too late to develop a bump strategy for next fall enrollments. Sure we can try a few tricks, but the train has left the station, so to speak, and all that remains is trying to squeeze every bit of yield we can out of a dwindling pool of prospect/applicants. A focus upon the flow and prioritizing within the workflows is required. 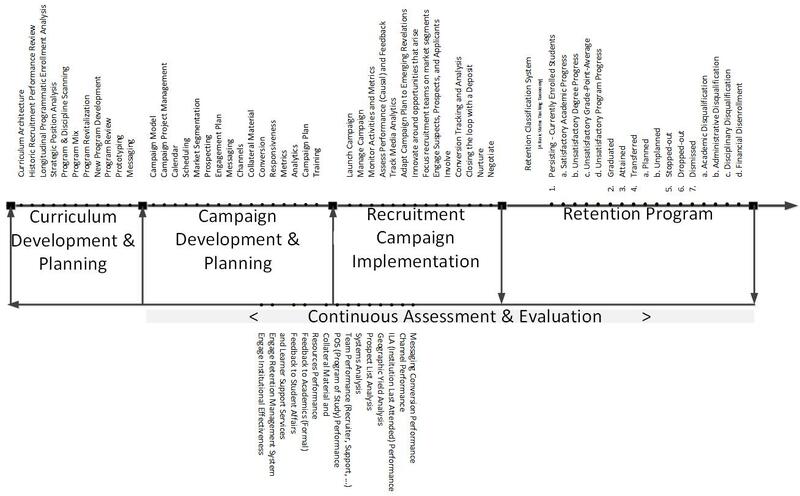 Figure 3: Academic/SEM Cycles Flow Model separates out the Retention and Campaign Evaluation pathways and connects them in a flow and feedback pattern to begin to work through the various interrelationships. The schematic view of the workflows outlined in Figure 3 is illustrative. It has not been developed as a comprehensive list but rather as a prompt for compiling a bespoke institutional list. Inevitably compiling a list of workflows responsible for enrollment engages the politics of the organization, especially when the list includes programs of study, curriculum development and academic planning and strategies. In the end, the totality and comprehensiveness of the family of Academic Strategic Enrollment Management Workflows must come together into one cohesive system with a blended culture and focus upon institutional sustainability. I hope this brief sketch of the five Academic and SEM Cycles & Workflows provides an insight into the basic weave of complex elements that culminate in an enrollment report. We encourage your input, thoughts, suggestions and comments. In our continuing effort to support our clients, MGDA is excited to announce our schedule of Transformational Strategies Institutes for 2015. Our Institute series recognizes the need for unprecedented collaboration between academic and enrollment domains guided by new visionary strategic plans that forge a cohesive approach to a future full of uncertainty. We continually develop resources to help the journey into the future, so please check in regularly. To stay connected and engage with your colleagues, join the ASEM Group in Linked In. This is the seventh post in the series on Academic Strategic Enrollment Management. No one can achieve and sustain long-term enrollment and fiscal health with mandates or short-term, reactive, quick fix initiatives. Strategic Position is defined as the sum of the competitive characteristics an institution or program possesses when compared to other institutions or programs in the global learning ecosystem or specific market segments. The concept comprises both marketing and branding and extends the efforts of competitiveness to a holistic, proactive, cohesive process defining, developing and implementing a strategy of sustainability. The roots of strategic positioning lie in the academic master plan and the academic culture and curriculum it defines, builds and sustains. The most effective enrollment management strategies are designed to build and sustain strategic market position. The process begins with institutional strategy emanating from mission and vision. The concept of strategic position is built around assessing where an institution is with respect to what prospective students are looking for in an educational opportunity and what other providers in its competitive sphere offer. The assessment of strategic position is informed through at least six lenses. The demographics lens examines enrollment strategy and performance against geographic scope, reach and yield. Scope assesses and defines target populations, reach details tactics to engage target populations and yield measures enrollment performance. The learning outcomes lens examines the metrics and perceptions of the benefit and value added through the learning experience. The academic programs lens examines the scope and focus of the academic program mix requiring an evaluation of saturation and opportunity against market dynamics. The research and scholarship lens examines the comparative scholarly performance of the institution against competitors. The employment domains and discipline spheres examine the requirements of employers, contemporary realities in academic communities and the performance and success of alums. The community of practice lens examines academic strategies tied to emerging trans-disciplinary communities of practice that require a collaborative academic background to join. 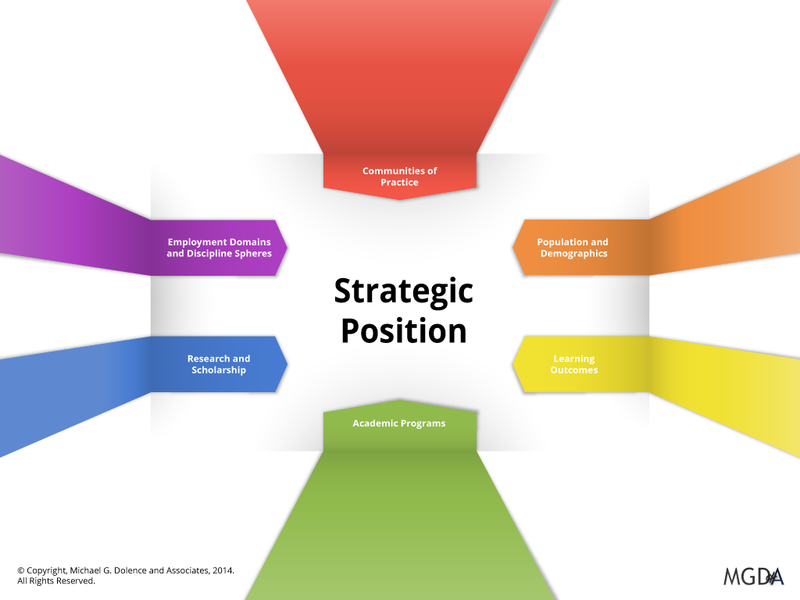 Figure 1: Six Lenses Informing Strategic Position – Strategic Position can be defined as the sum of the competitive characteristics an institution or program possesses when compared to other institutions or programs in the global learning sphere or its specific market segments. Achieving strategic position requires the institution to define the specific parameters that position the institution in the global learning marketplace. Enrollment managers work as partners in developing strategies to achieve and to maintain the competitive position of the institution within the global learning market. The learning marketplace is dynamic, and those dynamics change over time and within each competitive domain an institution is recruits. It is important to anchor recruitment campaigns in strategies that align the academic portfolio with market parameters. Strategic position as a conceptual approach recognizes the confluence of factors, forces and elements that contribute to the competitiveness of the institution in the global learning market. Examples of parameters driving strategic position. Defines the actual and targeted geographic representation of enrolled students. Expressed as percent distributions by defined geographic regions (e.g. zip code, county, region, state, country). Provides a framework to align enrollment targets and performance with population distributions and dynamics. Geographic mix defines the raw suspect pool that yields prospects and eventually enrollments. If the geographic mix is too narrow the pool is not large enough to achieve or sustain enrollments. If the mix is unfocused (such as international by country) or undeclared then, the services required for student success may not be available. Geographic mix also helps determine who the competitors are. An urban independent institution with numerous competing academic neighbors and an enrollment profile so localized it was termed line of sight recruitment experienced steady erosion in enrollments. Their initial proposed geographic mix strategy involved a three-year focus to develop the capacity to expand to contiguous states then to a twelve state region. In addition, because of well-developed affiliations a limited international effort was also recommended. The strategies in this case were directly linked to specific programs of study. Defines the array of academic programs and services an institution offers to the population it serves. Provides a framework to align credentials with economic, social, political, and technological challenges and opportunities. The mix of programs and disciplines ultimately define the profile of the institution to the learning marketplace. Program of study clusters can also be used to position schools, colleges, and departments in communities of interest and practice. The goal is to generate a following among influencers and a constant buzz in the social media regarding programmatic opportunities. Institutionally focused general marketing while necessary is insufficient alone to sustain healthy enrollments. Program level marketing must be developed and sustained. A college of art and design offered a limited number of programs of study. The growth strategy involved adding four programs of study in developing the first stage of enrollment futures strategy. The programs rather than being selected from interest areas among faculty were selected to build a cohesive strategic position in the market. For example, a Business of Art and Design program was developed in order to emphasize the economic value of art and design and highlight the role of the institutions programs in producing practicing artists and designers. Geographic mix was then considered. The same institution relied heavily upon in-state enrollment with a geographic mix of 77% in state, 20% other 49 states (but predominantly six other states) and 3% international. Is this a healthy distribution? Defines existing and emerging disciplines and employment sectors and opportunities. Provides a framework for connecting and aligning structured disciplines with economic opportunities. The linkage between academic disciplines and preparation for employment within defined economic sectors is of extremely high value when developing academic strategy. It is often deeply misunderstood. Every academic credential needs to embed employability knowledge and skills into the curriculum. The narrative describing the curriculum must make the case that the curriculum is up-to-date, relevant, and content and experience rich. These were embedded into the curricular experience and designed to be assessed. Defines emerging need or problem based communities. Provides a framework for understanding and aligning multiple programs and disciplines with emerging global needs and opportunities. Communities of Practice represent self-identifying contemporary clusters of individuals with diverse knowledge, skills and credentials coming together to address an important issue, problem or need. They are very fertile ground to identify, shape and develop new curriculum. The community of practice lens is also a great way to approach existing curriculum revitalization and market realignment. A School of Management had developed and was preparing to launch a program of study in fraud and forensics. The preliminary design was primarily accounting in nature. The scope of practice was narrowly focused. By engaging the communities of practice that included judiciary, law enforcement, and financial sectors in a structural review of the preliminary curriculum significant changes were made. As a result of the participation, the Communities of Practice members populated the initial program cohorts and augmented faculty expertise. Defines the knowledge and skills acquired form engagement in an academic program of study or learning environment. Provides a framework for mapping outcomes, developing narrative and leveraging academic value. Teaching and learning are the heart and soul of an academic institution. Differentiating an institution based upon learning achievement, teaching quality, learning environment, and educational value-added is seldom attempted and difficult to achieve. Focusing upon learning outcomes includes completion rates, placement rates of graduates, and rankings and ratings by employers. It also structurally can be used as a guide to revitalizing the curricular design model. Recognizing that roughly half of the prospects searching for their first enrollment opportunity are undecided as to the major they are interested initial strategies were developed to launch a common first year experience for undecided majors. The curriculum was designed to provide a strong academic experience flowing directly into more than a dozen majors. It was designed without a time to degree extension penalty being required (similar to the Liberal Arts example above except within a human services curricular cluster) regardless of the major selected within the cluster. Defines the knowledge focus and foundation of an academic organization and its relationship to the global academic and knowledge ecosystem. Provides a framework for innovation, focus, and leveraging knowledge and discipline expertise. Research and scholarship anchor the academic reputation of the institution. The higher the demonstrable quality of research and scholarship the higher the perceived value of the learning experience. An urban universities’ professional school sought to increase their rank and strategic position among their peers and enhance both research and faculty and student recruitment. A review of the research scholarship platform revealed more than 50 centers, institutes, and laboratories. As the school designed a new facility a comprehensive focus resulted in re-conceptualizing the organization, integration and support of the research and scholarship functions. These examples illustrate in a nutshell, what we mean by taking a strategic position approach. The path to developing effective strategies can appear daunting and overwhelming. In order to construct meaningful strategy, we treat the view through these six lenses from the current institutional position as vectors. The concept of vectors adds two defining characteristics to the view through the lens, direction and magnitude. Note the primacy the curriculum and the academic portfolio play in developing strategic position. A well-developed strategically focused Master Academic Plan provides the best foundation. The use of the vector view is a powerful lens providing a focus for both the Master Academic Plan and developing Strategic Position. 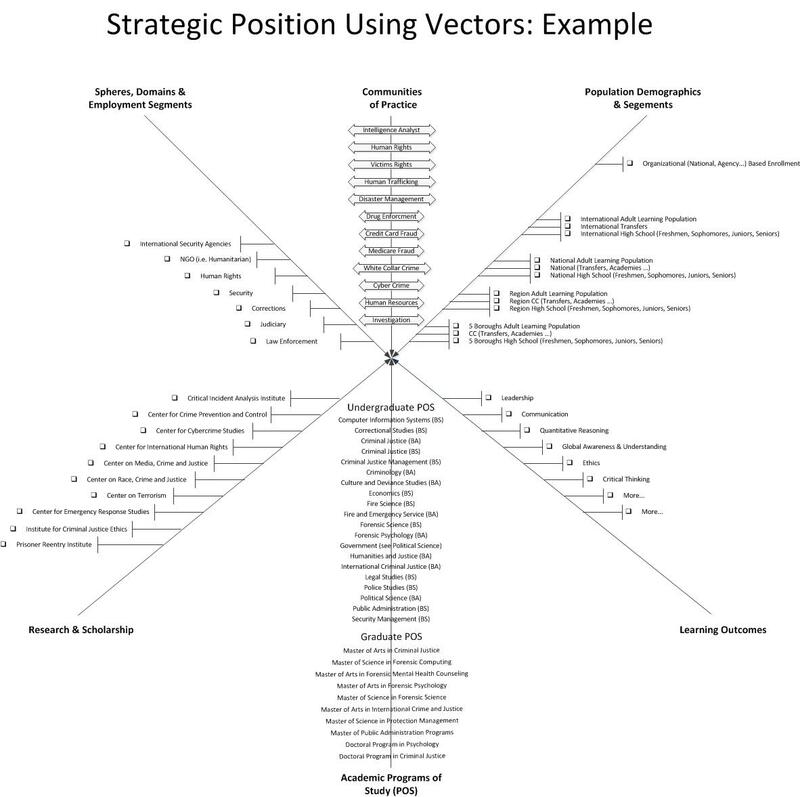 The vector view in figure 2 provides sufficient detail (an early draft and not the more exhaustive view) to synthesize cohesive and comprehensive strategies for the future of the enterprise. Each element on the six lens lines is in a state of change; increasing or decreasing, expanding or contracting, changing rapidly or slowly, either in growth or decline, is becoming more popular or more essential or is becoming less so. These six lens inform the development of the Master Academic Plan and help identify candidates for bump strategies, or long term development. They inform the status of the institutions current strategic position and provide insight and opportunities for future development. Such a view can plug back into an initial strategic position assessment using the SRS Method to develop a clear and concise translation and guide Strategic Enrollment Management strategies. Hopefully this Strategic Position approach has provided deeper insight into the intricate and detailed elements involved in constructing a comprehensive competitive position in the emerging global learning marketplace. A colleague commenting on this approach quipped “Wouldn’t it be nice if this were much simpler? Send a few Social Media messages, even put up a billboard on the freeway or placards in buses and by golly the enrollments would overflow. In a perfect world, they would all be eager, well prepared, well-mannered, full pay students that just do as they are told and graduate on time.” Pardon a quote from a contemporary commercial—“that’s not how any of this works.” It is complex; efforts take time and persistence, and results (not wishes) must be designed into strategies and initiatives. In the end curriculum drives enrollment, enrollment drives revenue and revenue drives everything else. That means ultimately strategies emanate from the curriculum (see “It’s the Curriculum Stupid”) and the academic enterprise.